A couple of days ago, I received a private Facebook message from a Hillbilly Housewife reader. She asked me for some suggestions on what she could cook for her church youth group on a tight budget. I gave her a few ideas, but knew that the HBHW community would come up with some things I hadn’t even thought of… sure enough, they didn’t disappoint. We’ll get into specific suggestions on what to cook in just a bit. First though I wanted to share a great suggestion from one of the comments. The basic idea is to ask for help. 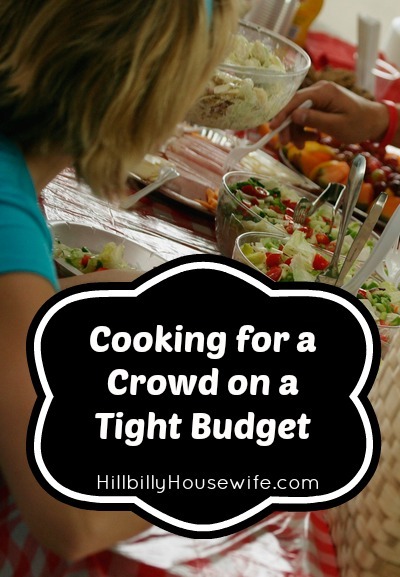 You don’t have to cook for a crowd on your own. No matter if you’re organizing a church supper, or if you’re having a big gathering for a family reunion, birthday or the likes. It is perfectly fine to ask people for help. You can approach this idea in two different ways. You can take care of the main dish or entree and ask everyone to bring complimenting dishes (assign them if you’d like by asking a few people to bring sides that will go well with your main entree, a salad, a dessert etc.). The second option is to ask everyone what they would be willing to make and bring and just make what you feel is missing. There are a couple of reasons why I love the potluck ideas. Obviously it is the most frugal option, but also saves you a lot of time in the kitchen. I also like the fact that you end up with a greater variety of food, making it more likely that everyone finds something they like. But it goes further than that. By allowing people to contribute and bring their favorite dishes, you make them part of the celebration. If you’re feeling a bit embarrassed about “having to ask for help” (which it really isn’t), think back to some times when you’ve been asked if you could bring your famous macaroni salad or apple pie. Did you mind? Did you think the person asking was being cheap or lazy? Nope… You probably felt proud and honored to be asked to contribute to the meal. Start with some filling but inexpensive appetizers. A platter of deviled eggs is always a crowd pleaser, as are chips and dips. Buy a bag or two of store brand potato chips and make a batch of homemade ranch dip. 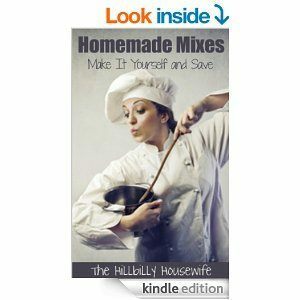 From the Homemade Mixes Kindle Cookbook. Mix all ingredients together in a small bowl until well combined. Store in an airtight container. For homemade ranch dip, stir 1 tbsp (or to taste) into a 16 oz container of sour cream. Keep in the fridge for at least one hour or until you’re ready to serve it. My biggest piece of advice here is to use meat as a flavoring instead of main ingredient. Instead focus on some starchy main ingredients like pasta, rice or even tortillas and beans. With all-in one meal ideas like above, you won’t need much when it comes to sides. I suggest sticking with some garlic bread and a side salad if you feel the need to add some side dishes. When it comes to drinks, keep things simple. Buying a bunch of soda or even juice can add up quickly. Instead I suggest you stick to one of the options below. They have the added benefit of not being nearly as bad for you as soda is. It’s easy to go overboard when it comes to dessert. Most of the time, people just want a little something after a big main meal. Pick something from the list below and make it from scratch or use your own favorite dessert recipe. Of course the simplest option is to ask someone else to take care of dessert. Ready For More Great Recipes? 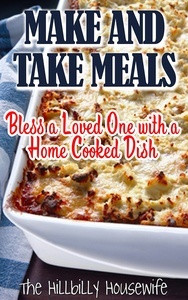 I wrote the book below for times when you want to take a meal to a family in need, but the recipes works just as well when you are cooking for a crowd.